Blazing-fast experience: addlink S50 provides UP to 550MB/s Read speed and UP to 500MB/s Write speed. The S50 also boosts UP to 5x faster than 5400rpm hard drive and eliminates waiting by reducing the loading and processing time within seconds. More reliable and durable: MLC (multi-level cell) provides higher endurance and increased lifespan compared to TLC (triple-level cell). Unlike old hard drives (HDD), addlink S50 has no moving parts and it can protect your data from shock and vibration. addlink S50 also runs cool and operates silently during use. 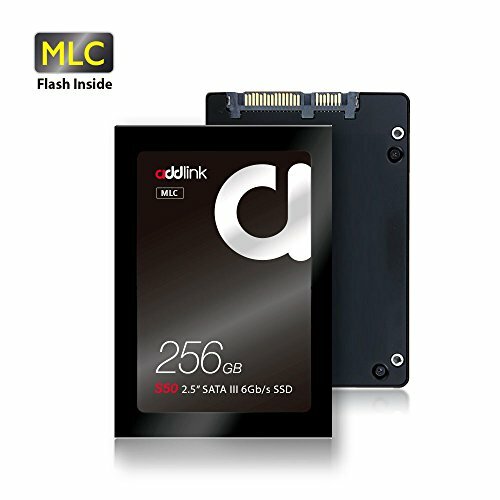 Big storage volume: addlink S50 256GB gives you plenty of storage to install your applications for videos, work, photos, games and other programs. More reliable and durable: Unlike old hard drives (HDD), addlink S50 has no moving parts and it can protect your data from shock and vibration. Besides anti-shock and low breakdown, addlink S50 also runs cool and operates silently during use. Ultra slim and portable: The 2.5"" and 7mm size of S50 makes it perfect for notebooks, ultrabooks and other portable computing devices. Quality Assurance: addlink offers 3-year limited warranty for your SSD products, an affordable solution that serves your needs from basic computing to intensive gaming. With addlink S50, you only need to replace a small fraction of computer in exchange for seamless and lag-free computing experience.